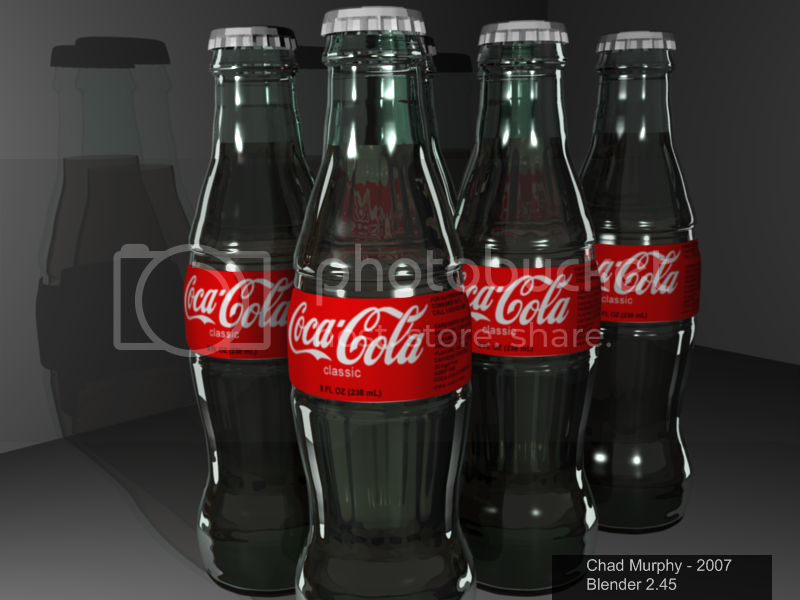 Have a Coke - My first REAL project. I still want to add a few more details, and maybe improve the Coca-Cola labels a bit. looks good, could use some minor improvements. labels looks stretched, have only one light make shadows, and turn down the mirror on bottles. also, don’t the bottles have a ribbed bottom? I believe the specularity should have a harder edge and be brighter. The smoother a surface is, the more specularity is going to act like just a bright reflection. In fact, you might experiment with just getting rid of the specularity entirely, and brightening the ray-traced reflections in the Nodes Editor. P.S. I really like the lighting effect you’ve got with the liquid - giving it that deep orange color. Thanks, so much for the comments and suggestions. Very helpful! I decided to redo the bottles to get a better glass look. I figure it would help to have a reference image. 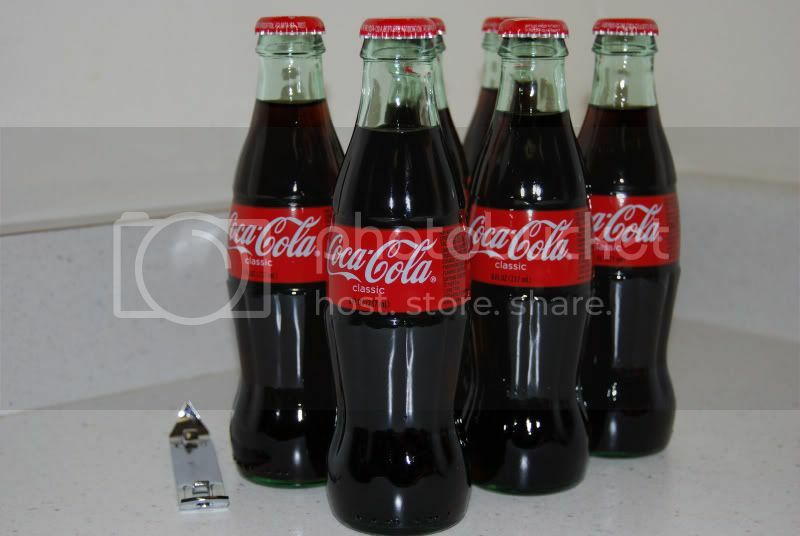 I couldn’t find any that I liked online, so I went to the store and bought a six pack of coke. It’s pretty cool that some stores still sell the glass bottles. Here’s the reference image. For the model, I still need to fix the liquid, and get the lighting back in there along with the floor and wall textures. (the lighting is what makes the coke have that dark orange color). I also need to finish the bottle caps. I think it’s getting there. Let me know what you think. Thanks. I’m digging the second render. The lighting and specularity on the bottles is pretty good. I’ve never much cared for Blender Internals transparent shadows though. Focusing on just the bottles though, they’re excellent. The caps are fairly hard edged and look low poly. It’s fine to be low poly but you don’t have to look it. You may want to look into subsurfing them and utilizing Edge Loops/Cuts to keep the forms. Hell of an improvement from one render to the next though. Fine work. Wow, that is a huge improvement from first rener to last, great job! Looking really good man. 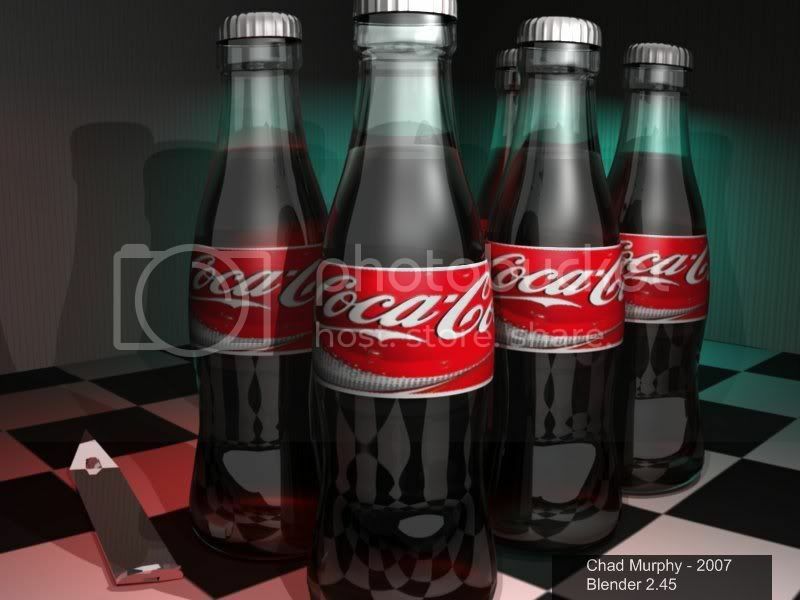 I don’t want to throw something else at you if you’re just now learning Blender for real, but you may want to try the YayFray renderer with this one, to make all those bottles throw around the caustics like they do in real life. Oh, and welcome to BlenderArtists!